The full day’s programme to mark the success of the rehabilitation of the Bač Fortress, a Grand Prix winner of the EU Prize for Cultural Heritage / Europa Nostra Award 2018, presented a unique opportunity to reflect and discuss new approaches to preserving cultural heritage. Following the Award Ceremony, at the round table discussion “Berlin Call to Action – Initiatives Deriving from the Award Winning Centuries of Bač Project”, international cooperation and the potential for development within professional and local communities was explored. The Berlin Call to Action “Cultural Heritage for the Future of Europe”, which was presented at the first European Cultural Heritage Summit held in Berlin last June, has already been signed by over 1,500 organisations and individuals. 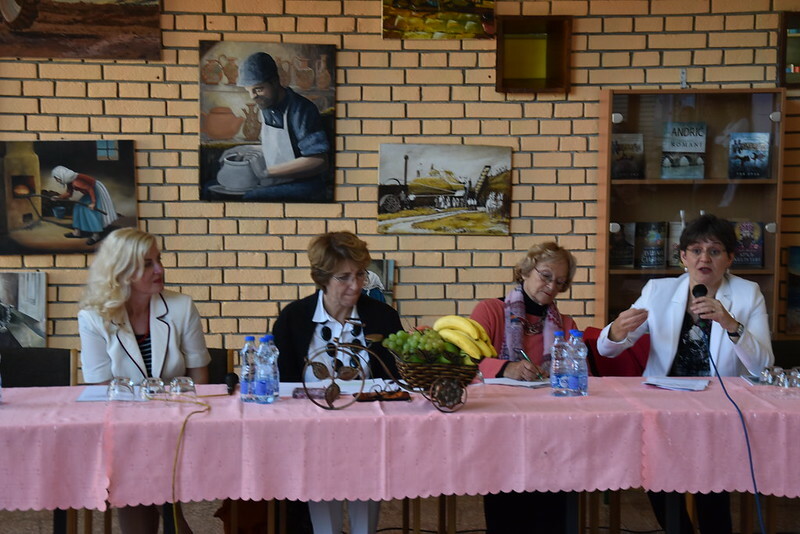 The round table discussion was held at the local elementary school “Vuk Karadzić” and moderated by Prof. Dr. Daniela Korolija Crkvenjakov, a member of the Heritage Awards Jury in the category Conservation. Participants were invited to share their ideas, projects and initiatives related to the “Berlin Call to Action” from the perspective of the “Centuries of Bač” project. Europa Nostra’s Secretary General, Sneška Quaedvlieg-Mihailović, underlined the need for local authorities to understand the importance and European dimension of local heritage and its potential for development. Dr. Slavica Vujović, author and manager of “The Centuries of Bač” project, highlighted that local multiculturalism is of particular value and importance to good management, and that there is a need for adequate cooperation between local, provincial, national, regional and international authorities to achieve sustainable development. Ms. Tijana Stanković Pešterac and Mr. Ilija Komnenić presented the high standards implemented at the Museum of Vojvodina and supported the strengthening and continuation of work on the model of diffusion for the museum in Bač. Prof. Dr. Jonjaua Ranogajec, professor at the Faculty of Technical Sciences, University of Novi Sad, explained the significance of the organised acquisition of knowledge and skills for the preservation and enhancement of the materials used in conservation, underlining the need to organise the “Summer school of materials in Cultural Heritage” in 2019. Mr. Rastko Vlajković, conservation architect from the Provincial Institute, presented future plans for the “Centuries of Bač” project, advocating the increased involvement of the private sector in heritage conservation. Olivera Ignjatović, representing the Ministry of Culture, underlined the extent to which the annual organisation of the “European Heritage Days” in Bač contributes to the valorising heritage among the residents of Bač. Ms. Dajana Maksimović, Principal of the Bač elementary school, explained the way in which history and heritage interpretation are taught at the “Vuk Karadžić” school and how it helps to instill an appreciation for heritage in the younger generation. The topic of heritage interpretation for children, as well as its importance, was further expanded upon by Dr. Zdravko Rajačić, a pedagogue and author of the project “Magic Adventures from the Past”, who initiated the printing of a new edition of the “Magic Adventures from the Past”, an excellent didactic tool for teaching various important topics, including understanding the past, the value of heritage and the importance of tolerance in modern life. The round table discussion was concluded by Dr. Irina Subotić, Vice-President of Europa Nostra and President of Europa Nostra Serbia, who once again underlined the quality and European dimension of the “Centuries of Bač” project. A very inspiring visit to the Bodjani Monastery, famous for its unique fresco painting, was led by Mr. Dejan Radovanović, an art historian at the Provincial Institute for the Protection of Cultural Monuments. The celebrations and further informal discussions continued at the restaurant on the shore of the Danube river, part of a UNESCO Biosphere Reserve.